As usual, zucchini on my side, a little cheese (1oz) on Scott's. 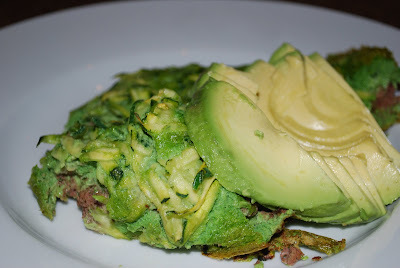 In a blender, whip the eggs and spinach with a splash of water. Set aside. In an omelet or saute pan over medium-high heat, cook the buffalo until browned, but still pink. Add the zucchini* and stir. Place pan in preheated oven and continue to cook until set, about 5-12 minutes (depending on pan). 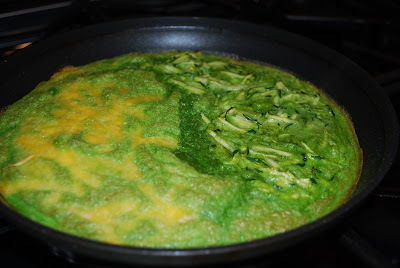 *I add the zucchini to my side and the cheese to Scott's side, after I add the eggs to the pan (Step 4). It's definitely the way to go!